What happens to a children’s public television show after it has been attacked by the secretary of education, pilloried by conservatives, then abandoned by its underwriters? In the case of “Postcards From Buster,” it manages to return, belatedly but unbowed, for a second season. In “Postcards From Buster” documentary footage of children from different cultures is combined with animation of Buster and his friends. This season includes only 10 episodes, which began in November and will run through February, a far cry from the 40 produced for the show’s first season. 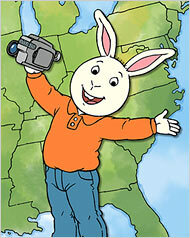 Children first came to know Buster Baxter, the animated bunny who is the show’s star, as the best friend of Arthur, the animated aardvark who is the title character of another PBS series. But most adults probably first heard of Buster in January 2005, midway into the show’s first season, when word got out that an episode about maple sugaring, called “Sugartime!,” would feature children in a Vermont family with two moms. Education Secretary Margaret Spellings attacked the episode in a letter to Pat Mitchell, the former PBS president, dated Jan. 25, 2005. “Many parents would not want their young children exposed to the life-styles portrayed in this episode,” she wrote. The same day PBS removed “Sugartime!” from its lineup. In the days that followed, the American Family Association, a major Christian conservative organization, orchestrated a campaign of more than 150,000 e-mail messages and letters to Ms. Spellings supporting her position, said Ed Vitagliano, a spokesman for the association. WGBH responded by independently offering “Sugartime!” to each PBS station. It said that 57 of 349 stations broadcast the episode in March 2005, making it available to more than half of PBS viewers. But the “Sugartime!” controversy made finding funds for a second season difficult. “All the traditional funding sources backed away,” said Jeanne Jordan, the series producer for the second season of “Postcards.” The Education Department’s Ready-to-Learn program, which had largely financed the first season of “Postcards” with $5 million through PBS, rewrote its grant to eliminate the call for cultural diversity, and PBS did not pursue that grant for Season 2. Neither the Corporation for Public Broadcasting, which is controlled by Congress and provided funds for Season 1, nor the traditional corporate sponsors of PBS children’s programming would underwrite the show. The producers, musicians, editors and writers of “Buster” were let go from the show for almost a year; under normal circumstances the second season would have begun in fall 2005. That fall PBS decided to provide most of the money needed for a season of 10 shows. With PBS on board other underwriters, among them the Arthur Vining Davis Foundations and the Annenberg Foundation, pitched in. WGBH also found about a half-dozen nontraditional donors, like the Gill Foundation and the Small Change Foundation, which support gay and lesbian causes. Perhaps surprisingly, this season continues to deal with hot-button issues. In an episode being shown today, Buster visits Fort Leonard Wood, an Army post in Missouri, to meet the family of a father who is stationed in Iraq. On Jan. 29 Buster will learn about the Mexican border, traveling with children to Tijuana from San Diego to meet their pen pals. And in the last show of the season, scheduled for Feb. 19, Buster revisits some children from the first season, whose homes in Louisiana were damaged or destroyed by Hurricane Katrina. Pierre Valette, one of the executive producers of “Postcards,” said that the show managed to approach even intensely political topics, like the war in Iraq and the aftereffects of Katrina, in an apolitical manner. Buster does this, he said, by looking at the world through a child’s eyes. In the episode from Fort Leonard Wood, for example, Buster must be shown where Iraq is on a globe, and he worries about being asked to do push-ups. A main purpose of the episode, Ms. Jordan, the producer, said, is to reveal what life on a military base is like, especially for a family that has a member serving in a war. Erin Munoz, a 10-year-old featured in the show, never expresses her opinions about the war. Neither does her mother, Cheri Munoz, or the other adults who were filmed. Next season producers are planning to do three specials, sending Buster to Africa, the Middle East and China. Ms. Sullivan of WGBH said the hope was that his travels abroad would attract international supporters, who weren’t interested in providing funds for the first two seasons, which focused on American children.